Yes, we will contact you on Monday morning then for your purchase. Does this price includes installation?? 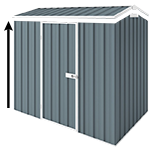 Hello, We only supply and deliver sheds, carport and garages and we don't have installation services. Our products are made for DIY market, and come with a complete kit including the instruction guides and most of our customers put them together themselves so we do not actually offer installation services and we don't have any installers to recommend.